Built as a battlecruiser under yard No 200 by Blohm & Voss, Steinwerder for the Imperial German Navy. 07 December 1908 laid down. 07 April 1910 launched as the SMS MOLTKE. Displacement 22,979 ton, 25,400 ton full load, dim. 186.6 x 30 x 9.2m, (draught), length bpp. 186.0m. Powered by four Parsons steam turbines, maximum power 84,609 shp, and maximum speed 28.4 knots. Range by a speed of 14 knots, 4,120 mile. Armament: 10 × 28 cm (11 in) /50 guns (5 × 2), 12 × 15 cm (5.9 in) SK L/45 guns, 12 × 8.8 cm (3.5 in) SK L/45 guns. Complement: 43 officers and 1,010 men. 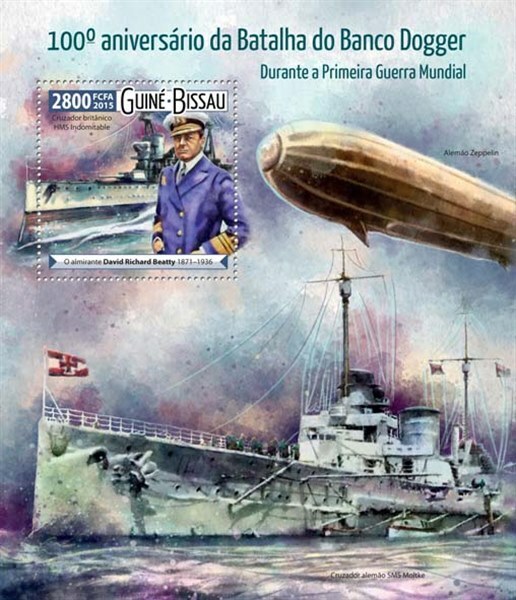 30 September 1911 commissioned. . The SMS MOLTKE took part in the Battle of Dogger Bank and the Battle of Jutland concerning World War 1 - she was scuttled during the German surrender. The German battlecruiser SMS MOLTKE was the lead ship of her class consisting of two ships with her sister becoming SMS GOEBEN. Designed in early 1907, the Moltke-class would be an improved form of the earlier VON DER TANN battlecruisers. MOLTKE and her twin were designed to counter British ships-of-the-line by blending speed and fire power and she was named for German Field Marshal Helmuth von Moltke who later became the chief-of-staff of the Prussian Army, eventually holding that post for thirty years. Moltke proved a great military strategist in the late 19th Century and became a national hero and celebrity in Germany. For his service to the fatherland, over 50 monuments were erected in his honour throughout the German Empire. During construction, SMS MOLTKE was identified as "Cruiser G" and she was officially christened on April 7th, 1910 and formally commissioned on September 30th, 1911 into service with the Imperial German Navy. At the time, the British Indefatigable-class battlecruisers posed a great threat to German Naval superiority and MOLTKE was developed as their counter - carrying more tonnage with increased armor plating and firepower improved through an additional main gun turret. MOLTKE's complement numbered 1,050 officers and men as built and this increased to a crew of 1,350 during wartime. She held a length of 615.78 feet (186.6m) long with a beam measuring 97.0 feet (30.33M) wide while her draft dropped to 29.4 feet (9.19m). Her weight was 22,979 tons when empty and displaced 25,400 tons under maximum load. MOLTKE was a trim ship in profile with a low silhouette and carried thirty-four guns (as built) including a main gun armament of five twin (double-barrelled) turrets holding 10 x 11.1" (28.3cm) SK L/50 (280mm) cannons capable of sending a 1,000lb shell a distance of 14 miles (513yd, 23km). The five turrets were mounted as one forward, two echeloned amidships, and a pair on the rear deck. These guns were capable of firing three salvoes per minute while the vessel carrier 810 shells in all - essentially enough for 80 full salvoes. The mountings for the 11.1-inch guns utilized electric pumps to drive hydraulic elevation gear while the training of the guns was powered by electric generators. The positioning of the turrets had the "A" ("Anton") turret at the bow placed at the center line. "B" turret was on the starboard side between the two funnels off centerline and close to the outside railing of the deck. "C" and "D" turrets, paired for stability, were on the centerline behind of the aft mast. "C" turret was mounted higher over "D" turret for maximum clearance with both facing the stern on the main deck. "E" turret was stationed on the portside aft of the amidships funnel and forward of the aft conning tower. Three of the five main turrets were on the centre line for ocean-going stability. This main turret placement provided near-maximum firepower with turrets A, C, D and E able to fire an eight-gun broadside to port and turrets A, B, C, and D firing the same broadside to starboard. If the battlecruiser needed to flee from a larger, heavier (and therefore slower) battleship she could fire eight guns aft (B, C, D, and E) against a ship that could, at most, only bring one or two of its main turrets to bear on the MOLTKE. If the battlecruiser was chasing an enemy cruiser, turrets A, B, and E could fire a six- gun, 11.1-inch volley forward against the fleeing vessel with her 6-inch gun array. The guns were an improved type although the range was initially less for the maximum elevation yielded only 13.5-degrees. After the Battle of Jutland (May-June 1916), SMS MOLTKE had the elevation of her 10 x 11.1-inch guns increased to 16-degrees and that, in turn, increased their range by 2,000 yards (6,000 feet, 1.12 miles). The secondary guns that were mounted were 12 x 5.9" (15cm) SKL/45 150mm fast-firing guns. Their placement were through barbettes along the second deck with the crews protected by armor on the inside of the hull. Six guns were placed at portside and six on starboard and these could fire a broadside against smaller attacking surface ships making torpedo runs against MOLTKE's hull. One gun on the port and starboard sides could fire directly aft and forward if needed. For aircraft defense, a scant amount of 12 x 3.45" SKL/45 88mm Anti-Aircraft guns were placed onboard as built. Four were found on the forward conning tower (main bridge area), two on the rear tower, two more on the main deck forward (protecting the bridge), and the balance scattered along the available decks around the ship. 2 x 19.7" (500mm) submerged torpedo tubes were placed, one on the centerline below the bow firing forward and the other in a stern facing aft on the portside - twelve torpedoes were carried, three per launching station. The "battlecruiser", as a naval warship classification, featured more armor than a traditional ocean-going cruiser though less than a battleship. MOLTKE's armored deck ranged in protection from 3.2" over the engine and ammunition spaces to 1" over areas needing less protection. To guard against torpedo attack, Blohm and Voss used Krupp steel for the 10.7" armored belt leading from "A" turret to "D" turret below the waterline. The belt armor was reduced in thickness to 4" close to the bow and stern. Bulkhead armor was 8" to 4" in thickness and AA batteries held 8" to 6" protection. The 6" gun barbettes followed suit with 9" armor in front thinning to 1.2" on the sides. The 11" main gun turrets were 9" thick on top to protect from plunging fire and on the curved front to deflect from horizontal fire. The armor on the back of the 11" turrets was 2.4" thick by the back door and the conning towers had a maximum of 14" to a minimum of 0.2" of Krupp armor plate. Propulsion for the MOLTKE was 4 x coal-fired Schulz Thornycroft boilers that produced the steam required to operate the 4 x Parsons steam turbines. These used pressurized steam to generate rotary motion to drive the 4 x shafts below, each providing 85,782 horsepower (63,968 kW). The propeller blades were 12.3 feet (3.74m) in diameter. The steering gear was connected to 2 x rudders,one ahead of the other. As designed the turbines could make headway at 25.5 knots (47.2 km/h, 29.3 mph) with a maximum speed of 28.4 knots (52.6 km/h, 32.7 mph) for shorter distances. Her range depended on the coal carried and fed to the boilers as well as onboard fresh water supplies and food for the crew. Her coal bunkers could hold 1,100 tons standard and 3,300 tons of coal maximum. Added later were tanks for 200 tons of oil. Sortie ranges also depended on her fuel stores and weather - calm weather meant a steaming range of about 4,120 nautical miles (7,630 km, 4,740 mi) at 14 knots (26 km/h, 16 mph) and a maximum operational range of 6,500 nautical miles (12,038 km; 7,480 mi) at 10 knots. The MOLTKE featured two heavy-duty lift cranes onboard, one on each side of the amidships funnel. Their purpose was to lower and lift supplies, from coal to food, in port as well as managing the two Captains gigs and two Pinnance boats stored opposite of turrets "B" and "E" when in open sea. Two smaller Quarter boats were hung on a pair of davits over the side of the ship opposite of the amidships funnel. The Captains gig were watercraft with smart lines used to take the Captain or other officers ashore and return them to the ship. The gig was 20 feet long and 3-to-6 feet wide and manned by 6 to 8 oars and a lig sail. The Pinnance measured 30 feet long, was rowed by 12 oars (6 per side) and was equipped with a pair of lig sails used to carry sailors to and from shore when the ship could not dock. The boats were not used as lifeboats as the crew varied from 1,000 to 1,350 men - simply not enough room. Instead, each man was issued a life jacket and rubber rafts were available for most. After her sea trials, MOLTKE served as Admiral Hipper's flagship from May of 1912 to June of 1914. World War 1 officially began on July 28th, 1914, to which MOLTKE returned to the primary base of the High Seas Fleet in the North Sea - Wilhelmshaven, port of Cuxhaven, located on the mouth of the Elbe which served as a major base in the North Sea during World War 1 (1914-1918). MOLTKE then took part in the raid on Yarmouth, England on November 3rd, 1914, shelling the British North Seaport and town. She shelled the port base of Hartlepool on December 16th shortly after. During the shelling, she was hit in turn by a 6" shell from a British coastal gun causing little damage. On January 24th, 1915, she took part in the Battle of Dogger Bank (1915) and was forced to retire when the battleships HMS LION and HMS PRINCESS ROYAL fired on her. For the next six months MOLTKE patrolled the North Sea when in August 1915 MOLTKE was assigned to support the attack on the Gulf of Riga (August 1915) in the Baltic Sea. During the attack, a British submarine sent a torpedo into her bow along the portside of her torpedo room. The hole could not be repaired until about 500 tons of water rushed into the ship - the blast itself killing eight. She started her pumps and found she could make about 15 knots so she was ordered to return to port for repairs under her own power. Her repairs kept her in port until June 1916 when she put to sea again with the High Seas Fleet in time to engage the British Home Fleet in the North Sea near Jutland, Denmark. The battle began on May 31st and lasted until June 1st, 1916 and became the largest naval action of World War 1. SMS MOLTKE engaged two British battlecruisers, HMS TIGER - the most heavily armored battlecruiser in the Royal Navy when the war started - and the Indefatigable-class battlecruiser HMS NEW ZEALAND. MOLTKE used her five turrets to fire 359 x 11" shells against the two British warships, hitting TIGER with 13 rounds. MOLTKE got the worst of the fire, receiving four hits on one of her 5.9in (15cm) guns causing casualties that amounted to sixteen dead and twenty wounded. Again MOLTKE was required to return to Hamburg for repairs and this lasted for two months until the end of July 1916. Once she was repaired, MOLTKE was assigned to patrol the North Atlantic once more. In early 1917, Vice-admiral Ehrhard Schmidt chose her as his flagship and in October, as part of s Schmidt's fleet, she participated in the attack on the Baltic Islands. In November of 1917, she assisted at the Second Battle of Heligoland Bight. For the next four months, she patrolled the North Sea and then was assigned to the High Seas Fleet. During two days on April 23-24, 1918, the fleet made its last major sortie of the war when it attacked British-Scandinavian convoys. MOLTKE was to play a major role using her speed to locate the British ships. On the morning of April 24, MOLTKE's starboard inner propeller flew off causing the turbine to speed up and forcing the engine-turning gear to explode. This sent fragments into the auxiliary condenser and the damage allowed almost 2,000 tons of sea water to flood the middle engine room. The boilers were submerged with sea water forcing the engines to be stopped. MOLTKE lay dead in the water while her divers were sent over the side of the stern to close the outer valves and stop incoming sea water. MOLTKE, unable to make power, was taken under tow back to port while her engine crew worked to regain power. The hard work was successful and, by 5:10pm the following day, the boilers and engines were operating and she was able to make way under her own power at 17kts. MOLTKE continued towards the repair docks while British submarine E42 was operating in the area. At around 10:30pm, E42 spotted MOLTKE and put one torpedo into her. The resulting hole in her side allowed 1,761 tons of water to flood, reducing her speed to 10kts but still allowing her to reach harbor under her own power. Her engines and damaged hull were repaired and she received a new propeller at the Imperial Dockyard in Wilhelmshaven. The work was completed on September 9th, 1918. MOLTKE went back to sea and took part in training operations in the Baltic until October 3rd, 1918. The Germans knew the war was lost at this point but felt a favourable naval battle for the High Seas Fleet against the British Home Fleet would force the Allies to grant favourable terms to Germany in the end. On October 24th, 1918, the order was given to sail from Wilhelmshaven. That night word spread that the fleet was to be sacrificed in a last ditch battle and sailors began deserting their ships. 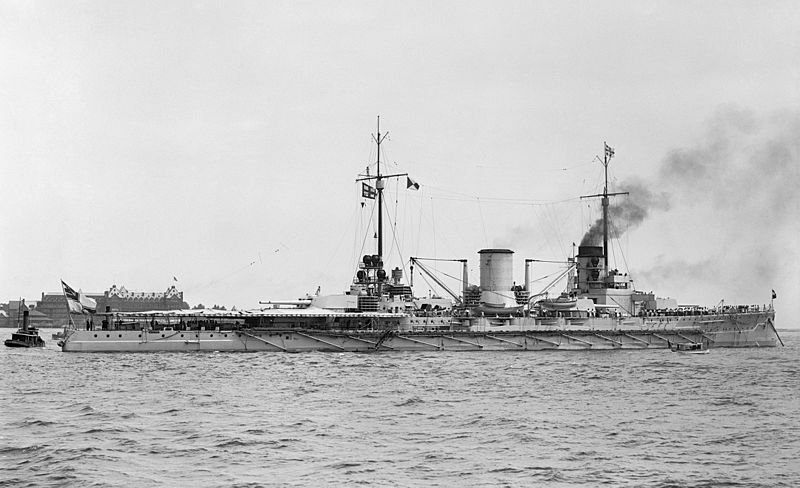 Some crews mutinied, others refused to weigh anchor, and still others sabotaged the battleships THÜRINGEN and HELGOLAND to keep them from making steam. On November 1st, MOLTKE was assigned as the I Scouting Group flagship for Rear Admiral Von Reuter and her crew remained loyal. The pressure mounted on the German Empire by this point in the war and, on November 11th, 1918, the Armistice was signed to officially end World War 1 - the Armistice signalled the end of the German Empire in history. On November 24th, 1918 MOLTKE with the High Seas Fleet was surrendered and interned at Scapa Flow, the home port of the British Home Fleet. On June 21st, 1919, with German crews still aboard, German fleet Rear Admiral von Reuter ordered the scuttling of the German High Seas Fleet so as not to have them fall into British hands - the MOLTKE sank in just 2.25 hours which, at low tide, the top of her superstructure was still visible. In 1927, MOLTKE was raised and eventually stripped of her useful components and scrapped in full during 1929 - thus ending her tenure on the high seas.